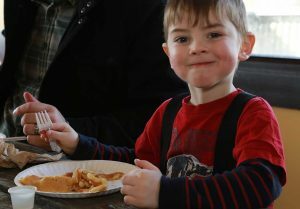 Bring Your Class or Group to the Maple Syrup Festival! 12 pm, 12:30 pm, 1 pm, 1:30 pm. 12:30 pm, 1:15 pm, 2 pm, and 2:45 pm. There is nothing better than the start of spring, since this means it’s maple syrup time! Come see the sap run and try your hand at tapping trees, sawing logs, balancing full buckets on yokes, and tasting sweet maple syrup, all while discovering the history of liquid gold. *Note: Please note groups that are not part of an education program will be charged HST. Check out Maple Syrup FUN FACT and ACTIVITY Sheets HERE! **NOTE: Pancake meals must be ordered 10 days before the trip. Lunch space is limited. We cannot guarantee nut free meals.